Andreoli is one of Valenza’s couture jewelers thriving and growing by targeting high-end customers with unique and special-commissioned pieces. Jack Hadjibay and now his daughter are continuing a family tradition. Elite Traveler Editor-in-Chief, Douglas Gollan, met with Hadjibay in his Valenza workshop and headquarters to get an update. ET: Why don’t you start by telling us where you are from, where you were born, where you grew up and how you got involved in the jewelry business? Jack Hadjibay: We got into the jewelry business because of my father. It was our background, we were born into it. I started at the age of 17 when my father had a business in Italy. I was studying in the United States and I came to Italy just for a visit when I got involved in it and stayed here. I continued my father’s business by selling stones to the biggest manufacturers in Valenza. After a few years we developed the most important offices and factories in Valenza. Years later my partners and I decided to change our business a little bit. Two of us moved to the United States to sell, and I stayed in Italy to create the jewelry. 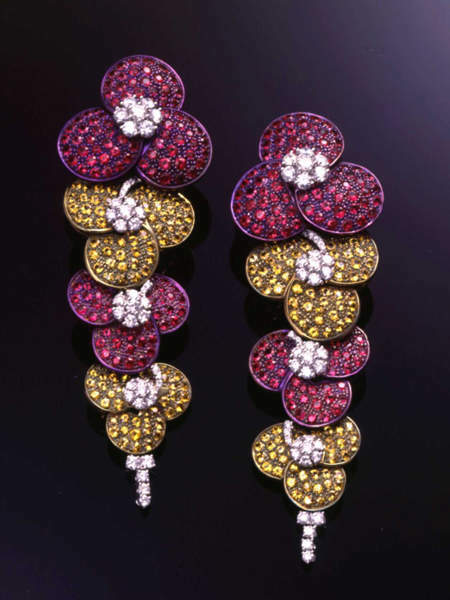 So since Valenza was the heart of the jewelry, we started very slowly with a few pieces and we were very successful. Then we started to do more—going completely into the jewelry business. After two, three years we were one of the biggest jewelry sales companies in the United States. From there we started to sell all around the world, selling to royal families and to a very high clientele. ET: Is this the second generation now in the business or is this a different business? Jack Hadjibay: No, this is the second generation business. ET: In addition to you, are there any other family members? I know your daughter’s in the business. Jack Hadjibay: Yes, my daughter continues the business in the United States with the help of my two youngest daughters and my wife. ET: I guess, as a parent, bringing a third generation in is exciting. But what are some of the challenges of having other family members in a family business, particularly your children? Jack Hadjibay: Different opinions, different ideas. They are up-to-date with the new generation, which I think is a very big help. It’s a big advantage because they bring new ideas and put them together with the old. ET: So one of the trends right now in the jewelry business is you see these conglomerates getting bigger and they seem to have unlimited resources. So what are the strategies for a smaller, family-run business to survive and prosper while these companies keep getting bigger? Jack Hadjibay: The most important thing is to have the right designs and the unique pieces—different from what everyone else has. Marketing research is for big companies. The thing that’s a big help for small companies is that we personally know our customers and we know what they like. ET: Do you design yourself? Jack Hadjibay: I do some of the designs, and we have a team of great designers. So three or four designers do different designs for the models, for the boutiques, for classical styles. We are putting everything together and it’s coming out really nice. ET: You have obtained a reputation for having very high-end pieces and high-end clientele. Is this how you want to keep going forward? Jack Hadjibay: Yes, that’s the only way I think in our business, in a small business, you can survive. Because if you don’t do that, you’ll just be like everyone else, not exceptional. You’re always going to be in competition and your business, after a while, is going to go down. ET: Stepping away from business, do you have any hobbies outside of business? Jack Hadjibay: Walking, relaxing, traveling and visiting different places. ET: What type of places? What are your favorite places to go? Jack Hadjibay: Places that I have never been before. ET: Okay, so what are some of the places that you want to go that you haven’t been to yet? Jack Hadjibay: I want to visit most of the Far East countries. Also, there are some places in Italy that I still haven’t had the time to see. ET: Any place in particular? Jack Hadjibay: Yes, the south of Italy. I never have time to go visit. ET: And down in Bari? Jack Hadjibay: Bari and Capri. I’d like to see all of that. ET: Looking ahead, where would you like to see Andreoli in five or ten years from now? Jack Hadjibay: In the future I think we would like to establish the business mostly in the United States and keep some business in Europe. ET: If you hadn’t gotten into the jewelry business, what would you have done? Jack Hadjibay: I would invest in properties. ET: Okay, so you would have been like a Donald Trump? Jack Hadjibay: I had in mind to do that. Maybe I will in the future after this business—if I still have time.